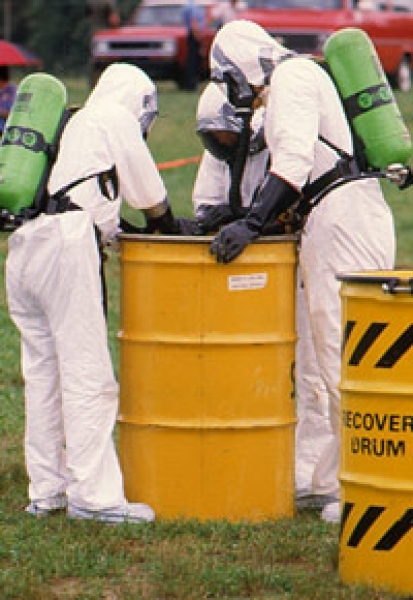 Hazardous waste disposal is a dangerous and sometimes unwieldy task. Midwest Service Group is experienced and thoroughly equipped to handle hazardous waste removal in a safe and timely manner. Hazardous Waste is potentially dangerous waste that presents a threat to human and animal health as well as the environment. It is found in many different forms and can exist as a solid, liquid or gas. It is important to note that hazardous waste can be produced in any quantity (major or minor) from large corporations to individual households. Midwest Service Group offers a variety of hazardous waste disposal services in the St. Louis area in an effort to promptly and effectively eliminate the potential health risks and minimize the environmental impact of hazardous waste. School Classroom & Science Lab Cleanup -When students are dealing with hazardous and potentially dangerous chemicals, safety is of the utmost importance. Midwest is available for classroom and lab clean up. Factory & Maintenance Facilities – When workers are exposed to hazardous waste on a regular basis, its important that all employees are aware of the risks and hazardous waste disposal procedures. Shooting Ranges and Armories – When lead is tested and classified as hazardous waste, Midwest provides disposal of leftover bullet material. Biohazards -Biological hazards are biological agents that pose a health risk to humans. Examples of biohazards would be medical waste, virus samples or toxins. HVAC – Freon Reclamation-Reclaiming refrigerant is a cost saving, re-processing procedure that restores product performance and is also environmentally conscious. Wastewater & Sludge – Wastewater, composed of a variety of human waste, sewage, and other drainage waters can be potentially dangerous and should be properly disposed of. Contact us for more information on Hazardous Waste Disposal.